Why hello there, it's me, your friendly neighborhood STOP sign. You probably recognize me—big, red, title all in caps. Hello there. You probably met me during driver's ed or behind the wheel or your driver's test. However, it seems like some of you don't know who I am. When and you see me, you think “By golly, what does this sign that says STOP want me to do? It couldn't possibly want me to stop in an orderly fashion.” Some might think of me as an ironic hipster and take it as a sign to speed through me. Don't do that. I am no hipster. I am very square, despite being octagonal. I understand your daughter might have been abducted by a drug cartel, and they forced you to be their getaway driver, and they said they'd give her a really bad haircut/death if you didn't comply. I understand that's why you might not know how to use me. But don't worry, I'm here to help! When you see me, stop. And when I link up with three of my bestest friends in the whole world, we form a 4-way stop sign. It's really great for us, because we get to gab and gossip and point out all the errors you silly drivers are making. Errors like not stopping... and not stopping. We really don't know much about the world outside of, well stopping. But we know it awfully well. Here's how 4-way stops work. It's a modified “Finders Keepers” philosophy. First person who gets to the stop gets to go first. They found an opening, and they're definitely going to keep it. Finders keepers. If people arrive to the stop at the same time, the person to the right gets to go. The one exception to this rule is those rare occasions when all four cars arrive at the stop at the same time. At that point, whoever says “Screw it” and goes gets to goes. There will be inherent problems with this. But don't worry, Stoppy Stop Sign will see you through it. If the person in front of you arrives after the person to the right, they might say “I'm too important,” and ignore all manners and just go. Just let this happen, because they are too important. However, after they go, it doesn't mean it's your turn. I've seen this countless times. Important person goes, then person behind him assumes the other STOP-buddies have given up on going. This is not so. Although when you do do that, it makes us STOP sign folks burst out laughing. Which is probably quite comical, seeing as how we're seven foot tall hunks of metal. Though comical, you don't wanna see that happen, because it just proves you're an idiot. Oh, and the name is “STOP sign,” not “STOP FOR ALL ETERNITY UNTIL THE COOL WARM EMBRACE OF DEATH TAKES YOU.” Although, that name is not without merit. Finally, the ones of me outlined in white, we're definitely optional. Feel free to ignore those ones. 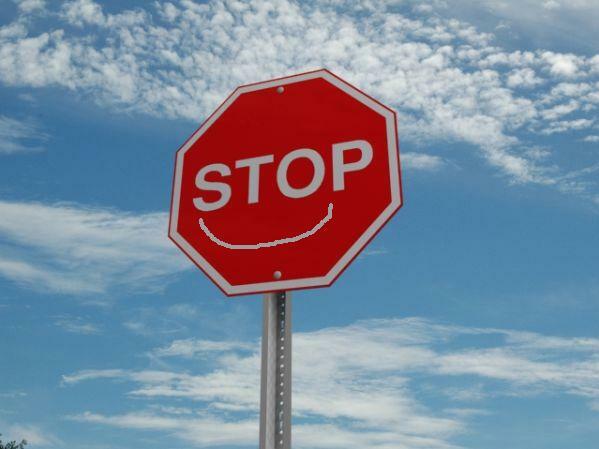 Have a safe and happy driving season, just remember, stop at a STOP sign, it makes us happy. In his defense, he was very important. Poor STOP sign though.